1. who's the guy that brings out your kilig? Well, to be honest, I don’t get kilig that much now (compared before). Dunno. Atleast may “kilig” factor pa rin, ‘di ba? Ha-ha. Stupidity. 2. Nakita kita sa CLSU may kasama na guy. To tell you, it was nice. 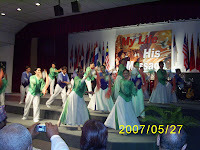 It was very inspiring for me, as a dance ministry leader & choreographer. 4. What course are you taking up? 5. Ilan readers mo sa private blog mo? Pano ba ma-access yun? I currently have 15 readers, I think. Uhm, you just have to send me your email ad (through friendster, multiply, or email) so I could add you up to my readers’ list. See you!. 6. Bakit minsan ka lang mag-update ng Q&A mo? I prefer accumulating questions before posting them.